Text: After tea went to the Red drawing-room, where so-called “animated pictures” were shown off, including the groups taken in September [sic] at Balmoral. It is a very wonderful process, representing people, their movements and actions as if they were alive. Comment: Queen Victoria (1819-1901) was filmed at Balmoral Castle, Scotland, by the photographic firm W. & D. Downey on 3 October 1896, in the company of her guests Tsar Nicholas and Tsarina Alexandra of Russia. 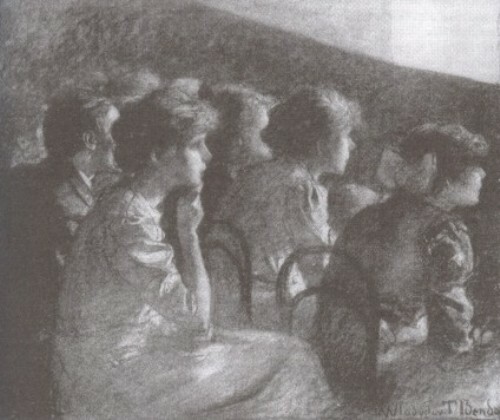 This account from her journal records the screening of the film by Downey, among a selection of other films, at Windsor Castle the following month. The film was billed by Downey as Her Majesty the Queen and TIMs the Emperor and Empress of Russia, TRHs the Duke and Duchess of Connaught, HRH Princess of Battenberg and Royal Children at Balmoral. This entry was posted in 1890s, Diaries, United Kingdom and tagged Domestic, Her Majesty the Queen and TIMs the Emperor and Empress of Russia TRHs the Duke and Duchess of Connaught HRH Princess of Battenberg and Royal Children at Balmoral, Royalty, Victoria, Windsor, Witnessing oneself. Bookmark the permalink.